Welcome to Stone Soup. My name is Maikel Carder. I have been making knives for over 30 years. 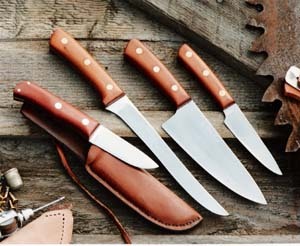 My knives are functional yet elegant and designed for everyday use by lovers of food and lovers of the outdoors. My knife-making and sharpening trade has been part of my life-long ambition to contribute to building a new society in the way we work, use resources, help rather than compete with each other, and treat the earth with loving respect. The band saw was the final straw. To the delight of my partner, not to mention the downstairs neighbor, I am no longer making knives in the living room. I now have space for a small shop in the basement of a local church house a short bicycle ride from the apartment. It's also where I help run a local soup kitchen and the base for Flatbush Mutual Aid. My new shop is nothing fancy. Indeed it fits right in with my other shops….the old Chevy step van, the former goat shed, and, my pride and joy, a sixties aluminum trailer, park model. There’s no windows in the new shop – it’s underground- but it’s warm in winter and cool in summer. I don’t spend as much time in the shop as I used to and I’m no longer doing shows but I do enjoy the work and as long as I can do a good job I intend to keep making knives. 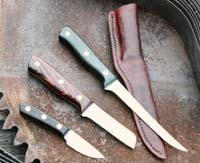 There are pictures of knives I have for sale right now in the Products section. You can also order knives anytime. Just call or email. On the Scrapbook page is a lovely story of a lost knife that a past customer sent me recently.